It is that time of the year, pumpkin is in season, in the air, and in your coffee. As you enjoy the taste of fallen leaves, cooler days, and pumpkin-spiced everything, you may wonder if you can share this simple pleasure with your furry fam ily member. 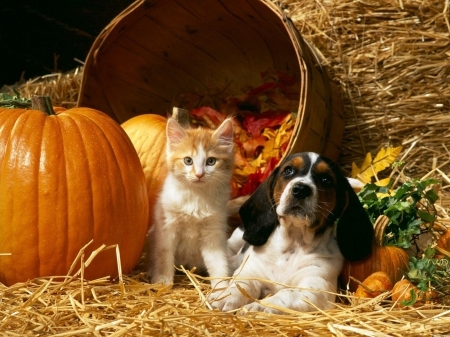 As we begin to have shorter and colder days, your pet may be less energetic and need a little help losing weight. A tablespoon of canned pumpkin in place of a teaspoon of your pet’s food (assuming a ten-pound furry, scale as appropriate) will make your pet as full as they normally do, but can help your furry loose a bit of weight. Pumpkin seeds are high in essential fatty acids, antioxidants, Vitamin A, beta-carotene, potassium, and iron. Your pet can eat them without any cooking necessary (so can you! ), but make sure you watch your animal with them. Some animals in their haste to enjoy the treat forget to chew, if this is the case, you may want to cut them into bite sized pieces for your furry. Here at PoshPaws, we appreciate that fall is a wonderful time of the year. During the fall months, you may request pumpkin-spice shampoo for your furry friend. What better way to share the season with your furry friend?